Are you chomping at the bit to start your cargo bike life journey but lookin’ to cut costs down a tad? Take a gander at our newly launched Second Life Certified Xtracycle program! 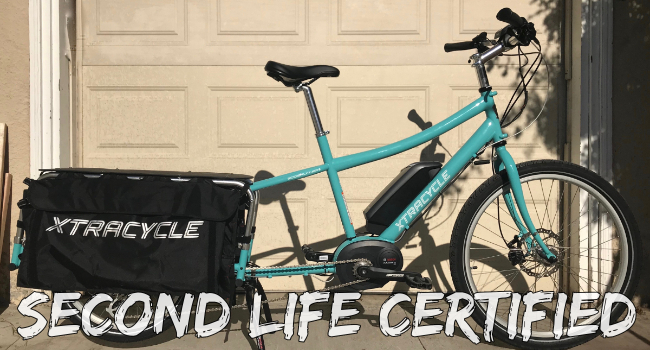 Second Life Certified (aka: SLC) bikes are gently used Xtracycles that have gone through our 71 point inspection, refurbished if necessary, and cleared for take-off by our professional staff mechanics. Second Life Certified bikes differ from our “On Sales” bikes in that SLC bikes aren’t 100% out-of-the-box, mint condition new bikes. They might have a little chip in the paint, a ding in a tube, they might be an EdgeRunner design proto-type, or a bike we used at the shop to run errands around town on occasion. All bikes listed will come with a detailed description of what makes them Second Life Certified and an SLC Condition Rating, ranging from New (Open) to Acceptable. You can get all the nitty gritty details about how we rate the bikes in our Second Life Certified Condition Guidelines here. SLC bikes have the same warranty period as new bikes, unless otherwise stated in the SLC bike listing. Each listing is slightly different, so be sure to check out the listing description to read up on all the bike’s details and what is included in the price. Getting your hands on an SLC bike is super simple and no different than ordering a brand new EdgeRunner. If you have an Xtracycle dealer nearby, just pop on in to the shop and they can have your chosen bike sent directly to their shop. If you are outside of a dealer area, you can check out on the website and have the bike sent directly to you, assembled and ready to ride, via our Big Box of Happiness program. If your pocket book needs a little extra boost, Klarna 24 month financing might be another option for you to spread out your new investment in a cargo bike. Financing, for those who are approved, is an option on all of our bikes and accessories, be they New, On Sale or Second Life Certified. With everything from brand new rides to sale bikes to used bikes to cargo bike conversion kits to financing, we hope there is something here to help usher you into the cargo biking world regardless of your budget. Have questions about the SLC Program or any SLC listing? Don’t hesitate to reach out at support@xtracycle.com! EdgeRunner, Xtra Xtra - Read all about it!